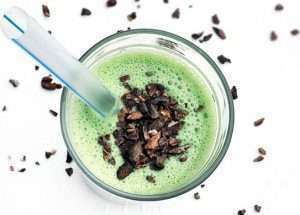 To celebrate St. Patrick’s Day, if drinking green beer or nibbling on a mint-chocolate chip ice cream cone aren’t on your menu, we’re thrilled to share Rose Cole’s healthy recipe for her Raw Mint-Chip Shamrock Shake. Blend everything together and enjoy!? For more healthy recipes, visit RoseCole.com. For more romantic recipes, check out our Love Potions! My girlfriend’s and I made these shakes this weekend, and they were a perfect way to end a day on the beach. I don’t think they brought any extra “love potion” magic, but they sure were good.